All that fuss about the National Planning Policy Framework and the need for more housing and then we find out that house prices are falling anyhow. Surely these house prices falls undermine the case for more housing? If only things were that simple. First, because the volume of house prices sales is currently low, fluctuations in these indices (which are based on sales) are less informative than usual. Second, taken at face value, the figures might tell us something about the current state of the economy but they are not a good indicator of long run conditions in the housing market. Why? Because economies that fail to build enough houses tend to experience high house price fluctuations. As argued by Philippe Bracke in this post from November last year this has certainly been true historically for the UK and there's no reason to think things should be any different this time round. As Philippe argues: "Ups and downs are an intrinsic feature of all economic series but booms and busts are not, and this is where the UK compares unfavourably with other countries. Even by US standards, UK house prices look like a rollercoaster: they more than doubled in real terms since the mid nineties; before that, they fell by almost 40% from 1989 to 1995. For prices to vary so much, quantities must be very sticky. Indeed, a recent OECD working paper shows that the number of new housing units built in the UK is low compared to other nations. A report by the Department of Communities and Local Government suggests that strict planning regulations hold back housing supply and make prices more volatile. [...] It might seem strange to advocate more house building in a period where house prices are falling. However, the current decline in house prices represents a cyclical adjustment that is not due to abundance of housing units. If this were the case, we wouldn’t see the current rent increases." "Setting aside the details, I think that the draft gets some big issues right, some wrong. Minor caveats aside, I support the presumption in favour of sustainable development. It cannot possibly be right that local bureaucrats and politicians get to say yes or no to development on a case-by-case basis. Instead, the presumption means that they have to say yes to things that are consistent with their local plan. Many other countries successfully run systems that are (at least) this permissive. But if, as this government does, you believe in localism then you have to give people a strong say in the development of their local plan to make the 'presumption' consistent with localism. The draft framework does this and again, caveats aside, I think this is a good idea. Finally, the government recognise that local authorities will need to be given incentives to agree to new development and have introduced a range of measures to provide these incentives. Whether these incentives will be large enough in practice is still open to debate, but I support the general principle. So much for the positives, what about the things it gets wrong? I think a fundamental problem is that the planning framework is backward not forward looking. We have a growing population and changing industrial structure and yet the draft framework works to limit us to living and working within an urban footprint that we inherited from the 1940s (if not before). This is particularly evident in terms of policy towards the Greenbelt. Towns expand in to cities by building on countryside and merging with outlying towns and villages. We are told that the Greenbelt policy is specifically intended to prevent this. In other words, the urban system we have now is what we have to work with. This severly hampers the ability of our set of cities to adjust to fundamental structural changes. It assumes that growing cities can expand by recycling old land, but many of the places that have strong growth potential are not existing cities, but larger towns. In short it makes the planning system about redevelopment more than new development. I understand the politics behind this (c.f. the natural trust) but the restrictions come at a cost in terms of economic growth. The other area where the framework is more backward than forward looking is in its approach to retail. Specifically, the government has decided to place a strong emphasis on town centre first policies. As regular readers will now, evidence suggests that these restrictions imposes substantial costs on households in terms of higher shopping bills. They also have the unintended consequence of creating more clone towns (as chains forced downtown drive out smaller retailers). Sequential needs tests then further limit competition with adverse impacts on employment and the cost of living. As with restrictions on Greenbelt development, these restrictions are also based on a 'zero sum' assumption - if we restrict out of town development than we will automatically get town centre development. But 20 years from now isn't it likely that the internet will fundamentally change the way we shop? Why shouldn't these restrictions on out of town developments hasten the move towards online shopping? Indeed, it is clear that this is already playing a role in what is happening in the high street. Overall, town centre first policies have costs as well as benefits and are based on a (possibly) outdated retail model. As I said, this feels more backward than forward looking and, once again, makes the planning system about redevelopment more than new development." If anything, the revised version has slightly reinforced the bad (with it's focus on brownfield first) at the expense of the good. But to this reader that was already quite strongly enshrined in the draft (even if the hysterical reactions from some countryside campaigners would make you think otherwise). And at least national brownfield targets have not been reintroduced with LAs now given the power to set those locally instead (something which SERC pushed in its assessment of the NPPF). Given the politics of all this, expect to see strong claims of great influence and radical changes - but on first pass (for this reader) it's a case of the more things change, the more they stay the same. What does daylight-saving time actually save? On Sunday Britain turned the clocks forward an hour - and summer time officially began. Mornings will be darker, evenings lighter. BST and other daylight-saving schemes are thought to reduce demand for energy (lighting in particular). But do they? It turns out we know very little about the real effects of ‘time shifting’. This is because most research that looks at daylight-saving, or time zones more generally, involves speculating what kind of effects could occur if we changed the policy – rather than taking actual measurements to quantify real impacts. A few researchers have tried to measure actual effects, mainly by focusing on what happens a few days before or after a time change. Two recent studies looked at daylight-saving time changes in the US state of Indiana (energy use went up) and in Australia (no effect). There also is some evidence regarding a reduction in road accidents and some (contested) work that looks at stock market fluctuations. In my current research on time-shifting and energy consumption, I make use of the fact that the United States spans multiple time zones, and that time-shifting arrangements also vary across space. I calculate the solar times of sunrise and sunset across the US, then combine this with information on different time zones and daylight-saving regimes. 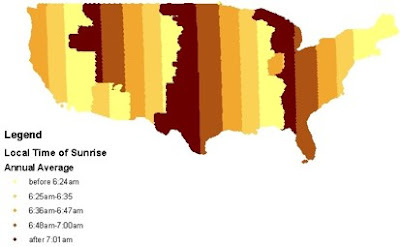 Putting this into a map, we can see how the annual average times of sunrise vary over space. Moving from the East to the West, places get daylight later until we hit a time zone boundary. (Irregularities are because of time zone boundaries, or because particular states had different daylight-saving policies in the early 2000s). I can then identify communities with, say, different solar time, but the same ‘official’ time or daylight-saving policies. So how does all this shape energy consumption? I first look at US counties in the same time zone. I compare energy use in Western and Eastern areas of the zone – both have the same ‘official’ day but the latter get the sun earlier. Next, I compare counties on each side of a time zone border. Here, ‘solar’ time is the same but ‘official’ days differ because of policy factors. 1) Counties that get earlier daylight in the North have lower annual residential electricity consumption. 2) In the South, on the other hand, early daylight is associated with higher electricity consumption. I am still trying to get my head around what might be causing these patterns. In the South I think it’s higher electricity consumption for cooling that is not offset by lower demand in the evenings. For the North I’m less clear. The policy implications are potentially profound, however - for example, if we’re interested in reducing energy use, perhaps the American North and South should each have their own time zones, or their own time-shifting policies. As academics say, this is work in progress. Comments are welcome! I'd highlight three urban policy issues arising from budget 2012. First, planning. The National Policy Planning Framework (and plenty of discussion) to follow next week. We are told that the presumption in favour of sustainable development will come and that the text remains short. But what this means in practice will depend on the details. Garden cities were also flagged pre-budget. The emphasis on gardens and pretty houses clearly appeals, but the extent to which the economics of this are much different to Labour's growth areas remains to be seen. Second, confirmation that the government wants to move towards local pay in the public sector. I have laid out the arguments on this earlier in the week (I am, on balance, in favour). 1. Public servants in poorer regions to get lower pay we are told by the Guardian. Misleading, at best, but captures the sentiment of many. In fact, what details we have suggest that this will be local, not regional and that pay will not be cut. Instead, once the pay freeze stops there will be higher wage increases in some areas than others. One way to do this would be to look at areas where it's difficult for the public sector to recruit high quality staff and allow wages to rise more there. Another would be to use finer grained data on (increases) in costs of living. Either of these would be better represented as 'public servants in high costs areas to get more pay'. 2. The most direct impact will be to raise the quality of public good provision in high cost areas. Colleagues at CEP, for example, suggest that low public sector wages in high costs areas lead to worse outcomes in the NHS. More preliminary evidence finds the same effect for schools and policing. Of course, addressing this through higher pay increases in high cost areas raises the possibility that these services would deteriorate in the poorer areas. Again, evidence from the NHS suggests this may not be a major concern because the effect is 'non-linear'. The bad effect of national wages in high cost areas are not offset by better outcomes in low cost areas (probably because higher quality staff in the high cost areas move to the private sector, rather than moving to the public sector elsewhere in the country). 3. What about the indirect costs on the local economies of disadvantaged areas? Here, we have very little evidence. In the short term, you could argue that the major issue in these areas is demand rather than supply. But these are not short term changes we are talking about - the differentials will tend to emerge only in the long term (as small differences in pay increases work through). It's also reasonable to suggest that longer term higher public sector salaries do create a local distortion that works against the private sector. Here there is a clear tradeoff. Higher public sector wages provide a demand stimulus to local service sectors. This likely offsets the distortion on the supply side (which comes from the fact that they have to pay higher wages to compete with the public sector). On the other hand, manufacturing (and other tradable) industries which don't serve local markets lose out because they don't benefit from the demand stimulus, but do get hit by the supply side distortion. Preliminary evidence from my own research on public sector employment suggests that these effects can be economically important. In short, high public sector pay may 'distort' local economies (towards local services away from manufacturing) and make them more 'dependent' on the public sector than they would otherwise have been. 4. What about 'fairness'? Personally, I prefer to think in terms of equal reward for equal work - which means that wages should reflect the local cost of living (something this move tries to achieve). Others may have different views - although I am unclear in what sense equal pay is in any sense 'fair' in this specific context even if there may be other reasons for supporting it more generally (e.g. for male and female workers doing the same job at the same firm). 5. On the subject of fairness, it seems reasonable to think that the negative effects of national pay in high cost areas are disproportionately experienced by poorer families. Partly because they will be the ones earning this pay, partly because they can't opt out of poorly performing public sector services. Again, personally, I think this is a bad thing. On balance, I think the case for local pay looks strong although, as the reaction of many make clear, the politics are likely to be nasty. Do city climate plans reduce emissions? Interesting paper from the Journal of Urban Economics (May 2012) suggests that climate change plans tend to be introduced by 'greener' cities to codify things they would have done anyhow. This suggests that, e.g., forcing other cities to adopt climate change plans wouldn't have much impact on emissions. From the abstract: "More than 600 local governments in the US are developing climate action plans that lay out specific measures to reduce emissions from municipal operations, households and firms. To date, however, it is unclear whether these plans are being implemented or have any causal effects on emissions. Using data from California, I provide the first quantitative analysis of the impacts of climate plans. I find that cities with climate plans have had far greater success in implementing strategies to reduce greenhouse gas emissions than their counterparts without such plans. For example, they have more green buildings, spend more on pedestrian and bicycle infrastructure, and have implemented more programs to divert waste from methane-generating landfills. I find little evidence, however, that climate plans play any causal role in this success. Rather, citizens’ environmental preferences appear to be a more important driver of both the adoption of climate plans and the pursuit of specific emission reduction measures. Thus, climate plans are largely codifying outcomes that would have been achieved in any case." My SERC colleague Max Nathan suggests one possible objection. It could be that local preferences might be shaped by previous plans, or discussions of future plans, or more general ‘political leadership’ that helps shape public opinion over a long time period. In that circumstance, environmental preferences are 'bad controls'. Producing the plan (or earlier plans) changes preferences which explains both the plan and the actions to reduce emissions. That said, I don't know of any evidence to support this specific objection (although not my area of expertise). Personally, I'd give more weight to the empirical finding - of no effect of the plans - than to the theoretical objection. I was at Portcullis House yesterday for the launch of the Greater Manchester Growth Plan. Speeches from Danny Alexander and Greg Clark suggest that the government remains committed to striking substantive deals with some of our major cities (we should see the details on the first of these fairly soon). [Disclosure: I sit on the Economic Advisory Panel that helped draw up the Manchester Growth Plan.] I won't go in to the details on the 10 recommendations that we make but wanted to comment instead on the broader issues. As I said at yesterday's launch - the Onion style headline for the growth plan would read "Manchester Plan calls for more Money and Power for Manchester". I share this immediate reaction but, on balance, I don't think that such extreme scepticism is warranted. Let me explain my reasoning. I should start by pointing out that my personal position on geographical disparities in the UK remains unchanged. The evidence is clear that who you are is more important than where you live in determining outcomes, but that both matter. It's very difficult to address either personal or area problems, but the evidence suggests that we have more success with the former than the latter. Given this, I would like to see policy focus on improving personal characteristics (e.g. skills) and then allowing people to take advantage of opportunities wherever they arise. In practice, in the UK, more of these opportunities will arise in the South than in the North. It's for this reason that I favour expanding housing supply in the South and allowing more people to live there. In other words, personally I would support more geographic concentration in the South. In contrast, part of the objective in giving 'more power and money for Manchester' is to work against more geographic concentration. I reconcile these differences because, tt the end of the day, I recognise that my personal opinion regarding more concentration in the South puts me in the minority. In other words, even if I am sceptical on geographical rebalancing (a 'normative' position) I think the recommendations in the Manchester growth plan should help achieve it (a 'positive' position). I should also say that I don't think that 'more power' is just about geographical rebalancing. I am convinced by the evidence that suggests that more localisation will probably improve urban policy making (I also agree with the broad principles that underpin this move). Ironically, however, I'm less convinced that there is much evidence that localisation will have a large direct impact on economic growth. Still, I think we should support it because the highly centralised processes in the UK don't seem to have done much to deliver on economic growth outside of London and the South East. In short, the arguments for 'more power' are that (a) it should lead to better urban policy making; (b) it might lead to more growth and so we should try it. What about 'more money'? Here, there seemed to be some confusion at the launch. While the immediate recommendations revolve around powers, those on local government finance will lead to Manchester having more money in the long run (because it will keep a larger share of the tax revenues that it generates). So the recommendations are about both more power and more money. I think there are three arguments in favour of this. First, more money is conditional on more growth. This rewards Manchester for making difficult local decisions (e.g. on planning). In other words, more money is partly about getting the incentives right. Second, focusing expenditure on Manchester means that policy is at least working with market forces within the North West region. As I have argued before such concentration may be important in offsetting the very strong market forces working against the North as a whole (and in favour of the South). Third, the previous government tried jam spreading, the effects appear to have been limited, so now might be a good time to try some more concentration (especially given the overall fiscal position). Overall then, not the impassioned support that you would get from those with more 'skin in the game' but support none the less. More money and more power for Manchester is a policy experiment worth trying. In a recent blog post, Allyson Pollock, Alison Macfarlane and Ian Greener misrepresented work on NHS competition done with Zack Cooper, Simon Jones and Alistair McGuire, and built straw man arguments designed to undermine our findings. This might pass as political discourse, but is it academic debate? Perhaps these objections arose because of the publicity that our work has received, rather than the detail of the research. But our goal as academics is to produce the most rigorous research possible, with the further goal of promoting evidence-based policies. When we produce evidence that can have an impact on policy, we present this work and make it available to policy-makers, press and the public. Researchers in publicly funded universities are expected to publicise their work in a timely manner to policy makers. How else should good policy be formed or research funding justified? Pollock and her co-authors decried ‘The drip feed of pro-competition studies’ we have produced. In fact, there are just two studies. Our first study in the Economic Journal (EJ) looked at the impact of competition - by which we mean a move to less monopolistic local markets - on quality. This work illustrated that competition between NHS providers in a market with fixed prices led to better outcomes. Our findings were consistent with what economic theory would predict and they mirror precisely the academic literature from empirical research in the US. More than that, since our research came out, two subsequent studies by separate research teams (Gaynor et al and Bloom et al) have found nearly identical conclusions about the positive impact that fixed price competition has had in the NHS. Our second paper looked at the impact of this competition on patients’ length of stay (and was an expansion of an earlier paper). It showed that NHS providers in competitive environments shortened their pre-surgical and overall length of hospital stays (which we regard as evidence of improvements in efficiency). In contrast, the net effect of the introduction of private providers into the market was to increase the average length of stay in NHS hospitals and is potentially suggestive of cream-skimming. This latter finding is not overtly pro-competitive. These studies provide precisely the kind of evidence that policy makers look for, so that they can learn about what has worked and not worked in the past, in order to chart a sensible path forward. This is why they have had a significant impact. Of course, wide-reaching policy should not be set on the basis of one study. However, as a body of evidence grows, the case for policy action becomes more persuasive. What about the counter-arguments? So far, critics have not articulated a theory as to how fixed price competition could undermine quality in the NHS. They have presented no evidence of their own that competition has harmed patient outcomes. To be fair, Professor Greener has done work in this area. For example, in 2009, he published an article in a journal called Public Money And Management titled, “Patient Choice in the NHS: What is the Effect of Choice Policies on Patients andRelationships in Health Economies”. This ethnographic study presents insights into the attitudes of hospital managers and staff in one NHS trust. But is it ‘good science’ in contrast to our work which he and Pollock call ‘bad science’ and which they have criticized in the Lancet? Greener’s piece drew on 60 semi-structured interviews of NHS staff at a single NHS hospital; no patients were interviewed during the course of the research. From these interviews, he concludes that: ‘The case presented suggests that patient choice policies fall short on all of the conditions that are necessary for them to work. Patients in the case study were reluctant to exercise choice decisions’. Here, Greener is happy to use a qualitative style of research (interviews at a single hospital) to draw conclusions of his own against a national policy. However, when other researchers use qualitative research together with quantitative evidence to show that competition can have positive effects, there is less tolerance. In their co-authored Lancet comment piece attacking our research competition, Pollock et al. dismissed work by Nick Bloom, Carol Propper, John Van Reenen and Stephen Seiler, stating disparagingly that in their study: “An association with management quality is based on interviews with 161 senior staff that did not take account of relevant causal factors’. Bloom et al. involved interviews at 100 hospitals and integrated quantitative work with advanced econometrics. If this is ‘bad science’, what are we to make of the critic’s own work, which adopts a related approach? My colleague Henry Overman has kicked off a good conversation on this blog about what constitutes sensible blogging - we hope this discussion continues. We hope such a debate, plus our reply here, will provide a teachable moment to pause and reflect on how academics discuss evidence, consider the casual use of phrases like ‘bad science’ and begin a thoughtful discussion of the role of blogs in academic and policy debates in the social sciences. Elsewhere on the LSE site we give a further point-by-point rebuttal to the criticisms of our work. It is worth noting that Professor Pollock has raised these points before and we responded to her points twice, both in a Lancet letter, and in freely accessible online 8-page document (a detailed response that Pollock et al. do not mention) posted online, also included as a linked appendix to our Lancet reply. A version of this piece was originally published on the LSE British Politics and Policy blog. Does cultural diversity help London businesses? London exemplifies the cosmopolitan world city. Dominating the UK economy, a major hub of the global system, it is also one of the most diverse cities on the planet. The capital contains contains around 40% of UK immigrants, and has almost half the non-white population in England and Wales. London's schoolchildren speak almost 300 languages between them, and religious diversity is similarly rich. Immigration is a major driver of these trends, but not the only one. Many 'new' communities have been here for some time, and London's multicultural history is a deep one. Peter Ackroyd's biography of London records "Cymric Brythons and Belgae ... remnants of the Gaulish legions ... East Saxons and Mercians ... Danes, Norwegians and Swedes ... Franks, Jutes and Angles, all mixed and mingling together to form a distinct tribe of 'Londoners'." Worries about multiculturalism aren't new either: in 883AD, fearing unrest, King Alfred banished the Danes from the city, to the east of the River Lea. Today, a majority of Londoners are proud of the city's diversity, and see it as a social asset. Is it also an economic good? Economic analyses of diversity have traditionally focused on the labour market impacts of 'immigration shocks', rather than on wider effects of larger, more mixed communities and cities. These dynamic effects of diversity come in several flavours. For example, diverse workforces might have access to a bigger pool of ideas and perspectives, which could help firms to innovate. But mixed groups might also face communication and trust barriers, at least in the short term. Conversely, co-ethnic networks might help companies access international markets, or new 'home markets' opened up by immigration. However, discrimination could limit their success in the marketplace. We know surprisingly little about how the wider economics of diversity operate in any city, let alone in London. So in some research recently published by SERC, Neil Lee and I tried to find out. We used rich data from the London Annual Business Survey to test links between London firms' diversity and aspects of their business performance. We focused on firms' top teams, as managers and owners tend to make the business-critical decisions. Our analysis throws up four main results. First, management diversity - and co-ethnicity - are positively linked to innovation in firms. Second, this does not carry over into successful commercialisation of ideas. Third, firms' diversity shapes the markets they sell into: 'migrant-diverse' firms are heavily internationalised, while 'ethnic-diverse' firms plug into London's cosmopolitan home markets. Finally, we find positive links between migrant status and entrepreneurial firm formation. Together, these findings suggest a small but robust 'diversity bonus' for London businesses. So what does this mean for policy? Our results suggest the current Government's immigration policies are unhelpful for London firms: both the immigration cap and restrictions on post-study work routes seem likely to restrict the future supply of potential entrepreneurs in the capital. However, different skills are clearly required for starting up a business, having good ideas and taking them to market. Economists talk about 'noisy learning' as entrepreneurs try out new products, many of which will fail. However, our results suggest a commercialisation gap for many migrant and minority ethnic firms - which could be due to discrimination, a lack of skills, or poor quality business support. Our findings also highlight broader welfare issues. Long term, some employers could use these diversity effects to improve their business models; others might become dependent on relatively cheap migrant labour. There is already some evidence of 'migrant-dependence' in sectors of the London economy. Better regulation of wages and working conditions for migrant workers are important here, as are effective employment and training initiatives for low-skilled Londoners. A version of this post was originally published on the LSE British Politics and Policy blog. I wrote yesterday about misleading criticism of LSE research on NHS competition. In reponse to a couple of comments on my piece, one of the authors of the research (Steve Gibbons, SERC's research director) posted a reply. I thought his reply would be of general interest (particularly regarding their motivation for conducting the research which is discuss towards the end of the comment) and deserved a re-post. You can read the other comments at the bottom of my original piece. On other points raised in the comments, we have answered before the objection that these elective choices are not actually being made by GPs or patients. The evidence in the HES data (we do not report it in the current version papers) is that patterns of choice did change systematically between the pre and post-reform periods. GPS started referring to more providers and patients were less likely to attend their nearest hospital. But what is more important is that the institutional structure and information systems that facilitate choice were put in place in 2006 and it is the hospital response to these institutional changes, the threat of competition from other NHS providers, that is relevant, not whether different choices were actually being made by patients. I guess, if the GP commenting here has not made use of this choice availability, this is because he and his patients were happy with the choices he was making already and with the service being provided in his locality. The HES patient data suggests that this is not true in general of all GPs or all patients in England. Lastly, I am baffled as to what political intent critics think we have in writing these papers. For sure, we probably all have priors that involve caution about local monopolies, and think that not being offered a choice about where you can go for e.g. a hip operation is unlikely to be a good thing, either for quality or equity. I do not think this makes us rabidly pro-market or right-wing and I am not in favour of privatising the NHS (and nor are any of my co-authors as far as I am aware). Nor do we wish to see some kind of punitive competitive regime imposed on doctors, nurses or other NHS staff. My wife is an NHS consultant, so this would personally not be in my favour. On the contrary, the research is motivated by a general interest in the role of market structure in public service provision, following in a line of academic work in economics on this issue, and for a desire to provide evidence to help inform policy. Ironically, given the assumptions that people seem to make about our political motivations, the message from both our papers on NHS competition is in favour of more local NHS hospitals, not less." Is Heathrow in the Wrong Place? The Guardian reports that Justine Greening agrees with proponents of Boris Island that Heathrow is in the wrong place – “if you were starting from scratch”. But the fact is that we are not starting from scratch, and this has fundamentally important implications for decisions on airport policy. First, Heathrow has – admittedly inadequate – public transport links already in place. Second, and even more importantly, one must consider the costs any large airport inflicts on residents who might experience its noise and pollution without compensation. The conventional answer is that these are the people living near Heathrow. But it is not as simple as that. Almost no one living in Southall, Richmond or Wraysbury looks out of their windows and says – ‘What a surprise – there are noisy aeroplanes overhead’. Almost no one has lived continuously in the affected area since 1965 (although one occasionally appears on TV, unearthed by a journalist looking for a human interest story or a visiting politician). Heathrow has been a big and noisy airport for at least 40 years. Some people live in the area because they work at the airport; some because they are frequent users; but most live in the area because - all else equal - the cost of housing is lower there. Research on how housing markets work shows almost beyond doubt that house prices and rents fully reflect all the costs of disamenities such as aircraft noise, high crime or flood risk. In the same way, the cost of housing quickly adjusts to reflect the value of better local state schools, local parks or transport links. What’s more, people pay not only for current amenities but also for expected future values of those amenities, as I showed in some 2004 research [pdf]. So it is not just the present experience of aircraft noise and pollution that is reflected in house prices around Heathrow but reasonable expectations about levels of that nuisance in the future. So if we were truly starting with a clean slate, London’s main hub airport would not be where Heathrow is. But given that Heathrow is where it is, and has been there for more than a generation, it is in exactly the best place in terms of compensating people for the noise and pollution it causes. People who are affected have been compensated at least once via lower house prices and in many cases twice - because they have received help to pay for sound proofing their houses. Wherever they are, aircraft and airports cause local nuisance and pollution. So we need to compensate those affected by airports and reduce the environmental costs by taxing flying appropriately. But the best way of compensating people is through the housing market – and that implies not only Heathrow is 'in the right place', but that policymakers should focus any necessary expansion of airport capacity where airports are already located. NHS competition: bad science or bad blogging? Generally speaking I support the idea that academic researchers should engage with public debate. If we have evidence that could help inform policy and wider debates then it's right that we should publicise that beyond our own narrow academic communities. Blogging is one highly effective way of doing that. But every so often I read something on an academic blog that makes me pause and question whether more blogging will end up improving the quality of public debate in the long run. Yesterday's LSE British Politics and Policy Blog on NHS competition provides a good example of the kind of post that worries me. This post criticises research about the impact of NHS competition on patient outcomes and accuses my LSE colleagues of engaging in bad science, data dredging and faulty analysis. I assume that this post will have been read by far more people than the original scientific paper. That's to be expected - after all it is what the blog is trying to achieve. But as I read through the post I became increasingly puzzled by the fact that the criticism in the the post appeared to bear little relation to the scientific papers I had read. When I went back to the original papers this morning, this confirmed my original concerns. As I know people may not have access to the academic paper, let me give some concrete examples. The 'major cause of reductions in AMI'? PAPER: “using [acute myocardial infarction] AMI mortality as a quality indicator, … mortality fell more quickly (i.e. quality improved) for patients living in more competitive markets after the introduction of hospital competition (to the NHS) in January 2006"
BLOG: "The major improvements in outcome after acute myocardial infarction can be attributed to improvements in primary prevention in general practice and in hospital care". These points are not contradictory. Couldn't the major improvement be attributable to primary prevention and hospital care while hospitals that face more competition saw mortality fall more quickly? BLOG: "the government’s cardiac Tzar, Sir Roger Boyle, was sufficiently angered by their claims to respond with withering criticism: AMI is a medical emergency: patients can’t choose where to have their heart attack or where to be treated!" PAPER: "we expect that AMI mortality will decrease more quickly in more competitive markets from mid-2006 onwards after hospitals were exposed to competition created from the new NHS reimbursement system and the expansion of patient choice. While providers are not explicitly competing for AMI patients because competition in the NHS is limited to the market for elective care, we expect the market-based reforms to result in across-the-board improvements in hospital performance, which in turn will result in lower AMI death rates. To that end, Bloom et al. (2010) looked at NHS hospitals and found that better managed hospitals had significantly lower AMI mortality and that greater hospital competition was associated with better hospital management." In short, the paper is quite clear on the mechanism. Competition on elective care care improves management which also happens to benefit AMI. Why not use elective care directly? Because hospitals can 'manipulate' statistics around those in a way that it can't with AMI precisely because patients have no choice! In other words, the authors clearly understand that patients have no choice for AMI but this helps rather than hinders them in their research. BLOG: "Less than the half patients surveyed in 2008 even remember being given a choice, and only a tiny proportion made those choices based on data from the NHS choices website." PAPER: There were three components to the health reform only one of which concerned patient choice but all three of which sharpened incentives for hospitals. Also, even if patients don't remember being given a choice: "since GPs are highly active in informing the destination of most referrals, GPs now play a substantial role dictating how money flows around the post-[reform] NHS." There are several ways in which the reforms sharpened incentives for hospitals. Pointing to the fact that patients don't remember being given a choice doesn't seriously address whether or not these incentives worked in practice. BLOG: There is no biological mechanism to explain why having a choice of providers for elective hip and knee operations surgery [...] could affect the overall outcomes from AMI where patients do not exercise choice over where they are treated." But the paper doesn't ever claim that there is a biological mechanism. It claims there is an economic one via the incentives described above. BLOG: "They sweep aside decades of careful economic theory and evidence which shows why markets do not work in health services"
PAPER: Provides pointers to existing literature (and reviews) and specifically considers the reasons why evidence from the reforms of the mid 1990's, the internal market might not be very useful "because the internal market never created significant financial incentives for hospitals to change their behaviour"
BLOG: "if you repeat an analysis often enough significant statistical associations will appear." The work was subsequently published in "the Economic Journal. That it got through that journal’s peer-review process is perhaps indicative of the poor understanding of healthcare and routine data from reviewers of that journal." I don't see any basis for the first of these claims. Data 'dredging' is a serious problem - but not one that appears to apply to this paper (which shows that the results are robust to many different variations in specification - the exact opposite of the data mining problem). The Economic Journal is one of the world's leading peer-reviewed economics journals. I don't believe that peer review is everything, but simply insinuating that the referees and editors of that journal don't know what they are doing doesn't cut much weight with me. I could go on to discuss the errors around the second paper where, e.g., the blog claims that they don't control for the mix of operations when the paper actually considers within treatment changes in outcomes (so mix is irrelevant). But I assume that the authors are perfectly capable of further defending their own research. The new government wellbeing statistics suggest that London is the most miserable place in the country. Worse, from a personal perspective, in 4 years time I'll sit in the late 40s age group which will make me part of the unhappiest group in the the UK (men 45-49 living in London). Time to move, perhaps? This begs the question what we learn from spatial differences in wellbeing? As usual, the situation is more complex than the simple headlines would suggest. First, it's possible that small regional differences occur by chance. This can occur even when surveys are nationally representative because the number of people interviewed in any one location will be considerably smaller. Second, the survey tells us that individual characteristics affect stated happiness. From SERC work on wages we know that areas differences in wages look much smaller once we allow for the fact that different types of people live in different places. Indeed, a recent paper by Oswald and Wu for the US (published in the Review of Economics and Statistics 2011) show that the relative position of US states in terms of wellbeing shifts around a lot if you control for observed non-financial individual characteristics (i.e. not income). Again, from our work in the UK on wages we know that controlling for the unobserved characteristics of people would change these area effects even more. In short, when who you are is important in determining how happy you are, simple comparisons of areas are much less useful than they might seem. for a person of given characteristics". In other words, once we control for individual characteristics then there shouldn't be any spatial differences in wellbeing measures providing that the wellbeing measure is actually capturing the factors that determine people's 'wellbeing' (in the sense of utility). In practice, for the US, Oswald and Wu find that some spatial differences in wellbeing do persist but they also find support for a weak form of spatial arbitrage - once we control for individual incomes wellbeing is lower in states with higher average per capita incomes. In other words higher incomes are compensation for living in less nice places in terms of the non-financial benefits they deliver. So where does all of this leave this soon to be middle aged London based male? The evidence suggests that moving is unlikely to do much for my happiness (unless I am doing it because for personal reasons I know think me and my family would be happiest somewhere else). Instead, I should try to keep my wife happy (married people are happier), enjoy the kids (at least until they are 11) and start saving for that Porsche.